I hope you’re having a fab week. Today I thought I’d share some snapshots with you of a corner of my daughter’s bedroom, which is well on it’s way to being finished. When I started her bedroom, I knew I wanted white walls and floors, so we could have fun with colour everywhere else. Furniture, textiles and accessories can all be a rainbow of pastel hues. This chest of drawers was a charity shop find, and I had been thinking about repainting it, however once I got it in this corner, it looked so beautiful, so the colour will stay. I got the dolls house from a car boot fair at the end of the summer last year for £6. I’m hoping that it can be our little project this year, and that together we can have fun choosing wallpaper (scrapbook paper!) and little floral curtains. The walls in her bedroom have seen better days, and my dad helped me wallpaper some of the worst walls with thick lining paper to disguise lumps and bumps. 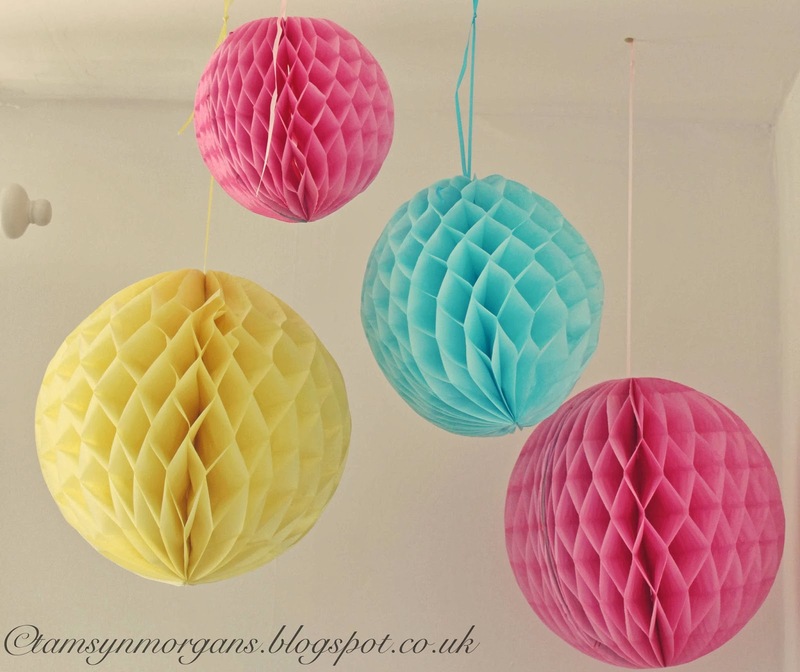 I bought these paper balls ages ago and thought they would be a lovely way to add a pop of colour, as well as taking the focus away from the wall! They are cheap as chips and such an easy way to make a fun focal point in a child’s bedroom. I got mine from good old Hobbycraft. Today is my day off work this week, so I shall endeavour to finish the living room and my daughter’s room, as well as unpack a few more boxes. It’s like Christmas opening the boxes, because I first packed back in September, so I keep finding things I had forgotten I had, including some gorgeous vintage china I want to share with you soon! Thank you all so much again for all your lovely comments and messages, I love reading them so much…have a wonderful day! The drawers are a fab find! 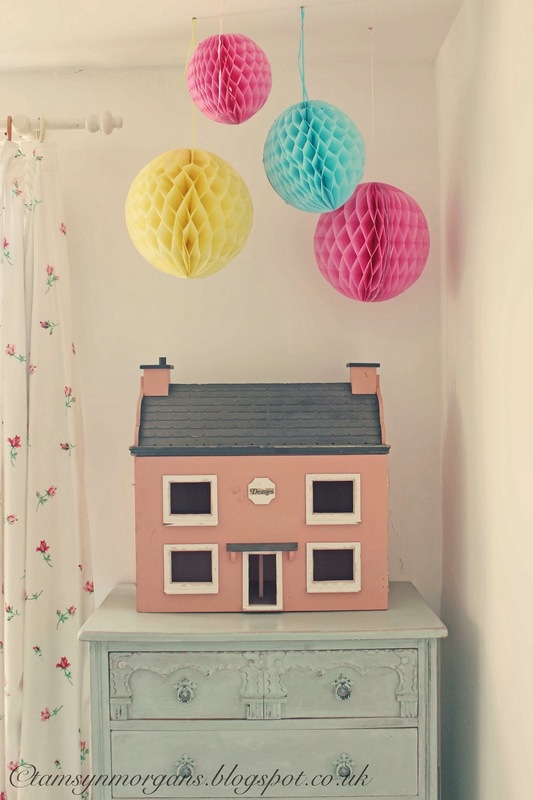 And what a cute idea to DIY the dolls house. I have a dolls cot that my dad made me for my 2nd Birthday, my Mum painted and embellished it with little fabric daisies. I love it and will never be parted from it.